On the first day of an 11-day roadtrip I was supposed to meet Bob Sumner for a hike in the Argus Range that we'd arranged a few weeks earlier. Though I had come prepared with snow gear, recent storms had Bob concerned about the conditions we might find for our hike and he sent an email outlining his worries. I didn't know exactly what we might find and had no issue putting it off for another time. As it turned out there was not so much snow at the elevations we planned to hike (less than 7,000ft),but I found an enjoyable alternative. I spent the day hiking in the Panamint Range, initially to reach Slims Peak which gets mention in Andy Zdon's Desert Summits, but things went so well I picked up a few bonus peaks afterwards. I made a large 16mi loop around Middle Park Canyon, climbing the ridge to the north and descending the one to the south - well over 7,000ft of gain in the effort which took a bit under 9hrs. 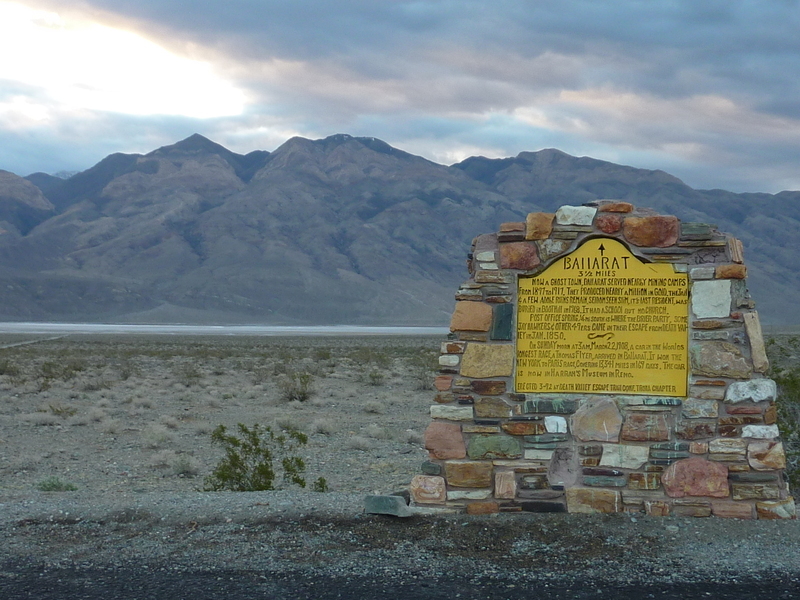 I had spent the night camped at Slate Range Crossing, the saddle on SR178 between Searles and Panamint Valleys. A nearly full moon had given me the impression on the drive through the Mojave that the Sierra and other ranges were steeped in fresh snow. In reality I was looking at the illuminated slopes that had almost no snow at all, at least below about 8,000ft. Where I parked just off the highway, the van was buffeted by strong wind gusts that blew pretty much all night. The sound of the fury and the gentle rocking lulled me to sleep easily, but I was up 3-4 times during the night to relieve myself - those XL sodas from Pilot during the drive have their price. I was up by 6:30a, warmed the van and then drove about half an hour to Ballarat and the entrance to Middle Park Canyon about a mile south of the (mostly) ghost town. Zdon describes a much easier, 2mi hike starting from Pleasant Canyon that requires high clearance. My hike would be about three times longer but not so bad, I came to find out. There is an old gravel road running 4mi up the northside ridge to the old Goldbug Mine, long abandoned (this is incorrect, see below), but the road is in decent shape. Jeeps and similar can drive about half the road to a fortified gate that stops further vehicle travel. There is all sorts of mining detritus found along the way, and much more around the locked building found at the main site. Beyond the mine site, cross-country travel up the ridge is made easier by burro trails that seem to criss-cross the slopes around here. The views out to the Panamint Valley improved markedly as I climbed, not just from the gain in altitude but by the eventual disappearance of the clouds that had kept things shady and chilly in the first few hours. There are good views off to the right looking down into Middle Park Canyon though it was difficult to judge whether there were show-stopping dry waterfalls if one were to descend that way. I decided that would not be prudent but noted the southern ridge across the canyon looked straightforward enough and began to think maybe I would head back that way, especially if there were a bonus peak over there to tag along the way (when I next checked by GPS I found there indeed was one). I reached Slims Peak before 11a, much better than I had initially guessed. One could see the snowy higher reaches north of Pleasant Canyon along the main crest of the range between Telescope and Sentinel Peaks. After perusing the register and photographing its pages (about 16 entries since it was placed in 2004), I poked around to see what bonus peaks I could find in the area to extend the day's outing. Park BM was the nearest, to the south across Middle Park about a mile. Unnamed Peak 7,500ft was another 1.4mi along Slim's ridgeline to the east. Both of these bonus peaks had more than 700ft of prominence which was enough to seal the new plan to tag both of them in an extended loop. The ridge continued to afford easy travel, now with stunted pinyons peppering the route. There was some snow on the north-facing slopes from storms past, but the south sides were snow-free as was the ridgeline itself and I never had to step on snow the entire way. I reached the unnamed summit in less than hour, finding no register but sweeping views towards the crest taking in the surprisingly shallow upper reaches of Pleasant Canyon and Middle Park. I had heard the sound of a motorcycle down in Middle Park somewhere but couldn't see it. I had driven up there a few years ago with Patrick and Tom in his old blue jeep, which we used to tackle some obscure peaks along the crest as well as the DPS Porter Peak. Porter and Sentinel rose much higher to the northeast and north, with complete snow coverage even on the south slopes. After leaving a small pill-bottle register on the summit (that I had pilfered from Slims Peak), I headed southwest off the summit and down into Middle Park where I crossed over a Jeep road before climbing up the other side onto the southern ridge. The ridgeline heading west up to Park BM is fairly benign, growing steep only for the last few hundred feet. The summit has slight difficulties, though nothing more than class 3. I ascended up the east side and descended the easier class 2-3 on the west side. Aside from the benchmark, the summit held a nice register in a red can left by Richard Carey in 2011. Inside were a few pages from an older register from Bob Sumner in 2006. On the inside cover of the newer register, Richard had indicated the summit had more than 1,500ft of prominence which is probably what had attracted he, Mark Adrian, Sumner and others to the summit. The correct number is less than 900ft, so I expect the peak will drift back to relative obscurity (no one had signed in since 2014). The descent off Park BM, dropping more than 6,000ft in less than 5mi was not as pleasant as I might have hoped, certainly not as nice as the northern ridgeline I had ascended. The burros had made some trails here, too, but the terrain was rockier and less forgiving. One needs to pay careful attention to foot placements for much of the descent and there were several talus slopes that I might easily have done without. Still, it wasn't all bad - the views were quite fine on the descent. One can look across the Panamint Valley and the Argus and Coso Ranges to see the snowy Sierra in the vicinity of Olancha Peak about 50mi away. The sun was reflecting off the thin layer of water at the south end of Panamint Valley which covered several square miles. At one of several old cairns used to mark mining claims, I found a rusty tobacco tin that held a lode claim from 1956. After photographing the contents, I tucked them back in the tin and replaced it where I'd found it. The wind continued to blow strongly as it had most of the day, but ever since the sun had come out after the first few hours it was quite nice and I was able to hike in just a tshirt. It was probably 70F on the ridge near bottom, but the wind cooled things nicely and I couldn't have asked for more cooperative weather. I spent about 2hrs descending the ridge, eventually dropping into the bottom part of Middle Park Canyon where I picked up the old road I had ascended. I spoke briefly to a couple who had driven to the mouth of the canyon about half a mile from where I had parked. They weren't all that surprised to see me (at least not as much as I was to see them) since they had seen my car parked at the bottom. They had been up here before to visit the Goldbug Mine ruins, so there wasn't any additional info I could share with them that they didn't already know. My father Thomas Whitman,and his partners George Sintay,and Ken Lloyd own the goldbug mine property from the locked gate,to above and past the end of the uppermost road.they also hold the claims that run from the top of the old tramline down to,and across pleasant canyon.IT IS NOT ABANDONED! !I would appreciate it if you would please change your post online about it being abandoned.it is currently up and running.people do need to go for supplies,and the day you trespasses must have been one of those days.its the assumption of people like you that cause vandalism,and robberies.